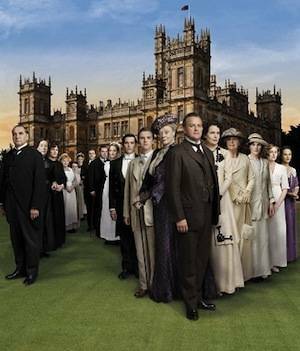 Several weeks ago I shared a possible cast of Abbey’s “upstairs” denizens; this week, we turn to the popular BBC-produced series’ servants (they aren’t “lower class;” some of them have more class than the nobles). The Majordomo of Downton, Carson has many qualities to recommend him as a beau, not least of which is his attention to decanting wine. Fortunately, he’s not as emotionally constipated as Ishiguro’s Stevens, but that may be because Carson’s real tendresse is for Lady Mary. Yes, Mrs. Hughes’s understudy comes from the same book as Carson’s, but really, both sets travel best in pairs. Like Miss Kenton, Mrs. Hughes nourishes an outside love, but unlike Miss Kenton, chooses not to act on that relationship. Actually, O’Brien isn’t classy enough to run the rigidly tight ship Mrs. Danvers does for Maxim de Winter, but she’s certainly deceitful enough to throw her mistress under the bus (read: allow her to slip on a bar of soap), then pretend she’s remorseful about it. With her strong self possession and orphan’s attention to detail, Anna is an easy doppelgaenger for Jane Eyre. If she polished her accent a bit, she might even be qualified to apply for governess positions one day–although she seems to be heading for life as a hotelier’s wife. We’ve already seen more strong feeling from Bates, the war-wounded valet to the Earl of Grantham, than Jeeves would allow over his lifetime, yet these two gentlemen’s gentlemen share a commitment to duty and a sense of humor, to boot. Due to the class-based nature of so much British literature, it isn’t easy to find a footman who is a main character–and although Pip of Great Expectations might be of the right stratum, Carroll’s Fish Footman’s bulging eyes and large lips look a lot like the Downton character’s. Sure, the Dodger exists in a pre-horseless-carriage era, but he’ll learn to drive! He’s a thieving orphan–but in his own way so is Irish patriot Branson, whose commitment to Republican causes trumps his ability to see that Lady Sybil isn’t ready to become a typical Irish wife. In the BBC Red Nose Day sketch parody of Downton Abbey, the comic playing Thomas gleefully exclaims “OH I’m SO evil!” This character’s exultation in his own nastiness can only be matched by Shakespeare’s arch-villain Iago, who destroys several lives in the course of bringing down his nemesis Othello. If only Iago’s fate were also Thomas’s. Is that mean? Mrs. Hudson’s harried housekeeping may not take place solely in the kitchen, but her frazzled demeanor surely influenced the Downton writers as they created blousy Mrs. Patmore, the cook whose constant state of overexcitement might presage the discovery of a Holmesian plot, especially one involving poison in the soup.